Anne Lamott meets Elizabeth Gilbert in this inspirational, side-splittingly funny exploration of the power of living with love, forgiveness, and honesty. For years Glennon Doyle Melton built a wall between herself and others, hiding inside a bunker of secrets and shame. But one day everything changed: Glennon woke up to life, committing herself to living out loud and giving language to our universal (yet often secret) experiences. She became a sensation when her personal essays started going viral. Her hilarious and poignant observations have been read by millions, shared among friends, discussed at water coolers, and have now inspired a social movement. 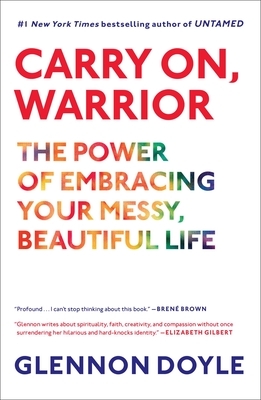 In Carry On, Warrior, Melton shares new stories and the best-loved material from Momastery.com. Her mistakes and triumphs demonstrate that love wins and that together we can do hard things. Melton is a courageous truth-teller and hopespreader, a wise and witty friend who emboldens us to believe in ourselves and reminds us that the journey is the reward. Carry On, Warrior proves that by shedding our weapons and armor, we can stop hiding, competing, and striving for the mirage of perfection, to build better lives in our hearts, homes, and communities. "Refreshingly frank. Writing, or as she calls it 'living out loud,' is for Melton a bracing therapy to chase away loneliness, learn humility, and banish the fears of revealing the less than flattering sides of herself."